“Dead men tell no tales,” the old saying goes. But it’s wrong nowadays. Thanks to modern science, dead men can tell many tales. So can dead women and children, whether their deaths occurred yesterday or forty thousand years ago. 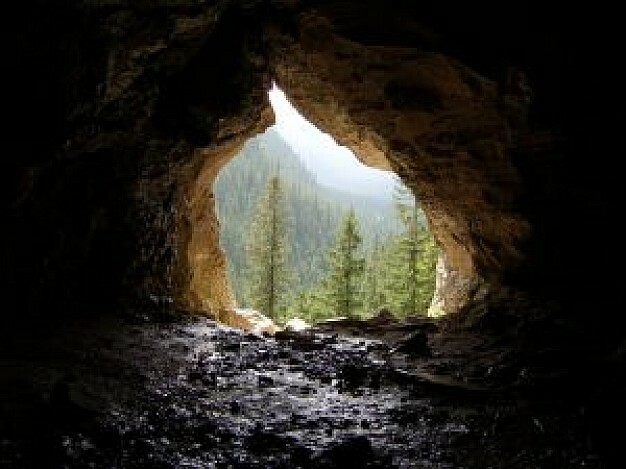 That’s how long the bones of ancient humans known as Neanderthals have been lying in the Goyet caves in Belgium. The tale revealed by these bones is a disturbing one. They have the marks of stone tools on them, just like the bones of horses and reindeer found in the same caves. In short, they’ve been butchered: the skin and flesh have been cut away and the marrow has been extracted. It seems that Neanderthals were doing the same to their own dead as they were to animals: eating them. But this disturbing tale of cannibalism is incomplete. We don’t know why the Neanderthals ate their dead. Was it simply for food or was it part of a funeral ritual? Perhaps they had religious beliefs about keeping the flesh of the dead in the tribe, while the souls of the dead flew free. They might have been just as horrified at the idea of burying or cremating a dead person as we are at the thought of eating one. And there are good reasons for thinking that the Neanderthals practised cannibalism as a ritual, not as a simple source of food. Neanderthal bones don’t just preserve the marks of butchering: they contain DNA too. When scientists analysed the DNA, they discovered that Neanderthals were unusually closely related to each other. Life was tough in Europe in the distant past: an ice-age gripped the continent and Neanderthal populations were never very high. This means that Neanderthals probably valued each other more: they were closely related and they knew that their numbers were low. And even if they were sometimes driven to cannibalism out of hunger, that doesn’t mean they saw it as a trivial act. People who live hard lives close to nature don’t treat the world lightly. They see spirits and symbols everywhere, because they know that only careful attention to their surroundings will ensure that they survive. In the modern world, we take many things less seriously because we’re well-fed, well-clothed and well-housed. Bad weather isn’t frightening to us. Winter isn’t a dangerous and hungry time any more. In Britain, we’ve long since killed off dangerous animals like wolves and bears. It wasn’t like that for the Neanderthals who lived in Europe all those millennia ago. They had to fight for survival every day and it seems likely that they had religious beliefs and rituals to give themselves a sense of control and purpose. At other ancient sites, Neanderthal graves have been discovered with flowers and jewellery inside them. Neanderthals were definitely human beings, they just belonged to a different species in the human family, Homo neanderthalensis. They obviously cared about their dead just as we do. Cannibalism seems an odd way to us of paying respect to the dead, but it isn’t unknown among Homo sapiens, our own species of human. Perhaps that’s the influence of Neanderthal genes, because our species interbred with Neanderthals when we left Africa and colonized Europe, Asia, Australia and the Pacific. Neanderthals might have died out as a separate species, but some of their genes are still alive inside our bodies. This means that when we learn about the Neanderthals we learn about ourselves. Cannibalism is disturbing, but it seems to have been a perfectly natural thing at some times and in some places. All the same, very few people today would hope that it becomes a familiar part of a funeral again. We prefer to carry our loved ones in our hearts, not our stomachs.